Gust GuardTM - The EZ solution for keeping covers where they belong! Secure your covers with Gust GuardTM and prevent them from blowing away! Gust GuardTM was developed by a retired automotive engineer who got tired of replacing his neighbor's car covers after each storm. Even those with a center clamp were constantly blown off in any strong winds. This clever design is easy to use and quite durable. 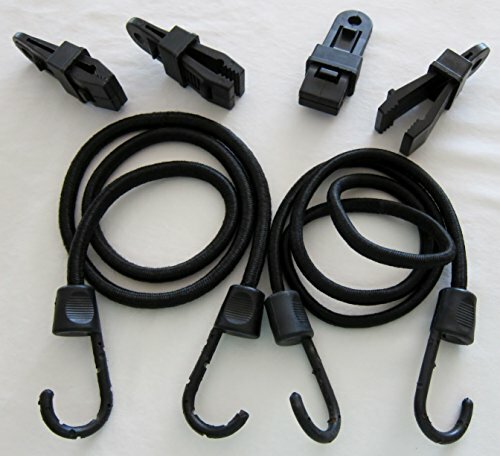 Using the four Gust GuardTM clips and the bungee cables you will be able to secure your covers for the applications below. Simply attach the clips to four corners of your cover and connect each pair of clips with one of the two tie-down cords. Now your cover will stay where you put it, even when the wind blows. Gust GuardTM - The EZ solution for keeping covers where they belong! Secure your covers with Gust GuardTM and prevent them from blowing away! If you have any questions about this product by Gust Guard, contact us by completing and submitting the form below. If you are looking for a specif part number, please include it with your message.